Chocolate Milk in Schools: Ban it, Keep it, or Change it? It’s time for a truce in the chocolate milk wars. A conflict over whether schools should offer flavored milk has been raging for years, pitting advocates for better school food against each other. While chocolate milk’s supporters insist the health benefits of milk outweigh any possible harm from extra sugar, its foes allege that chocolate milk is just like soda or candy. Meanwhile, as school funding shrinks, and costs for food, fuel and labor continue to rise, the chocolate milk battle divides advocates, just when it is most important that they join forces and work together. To recap the battle thus far: flavored milk accounts for about 70% of the milk served in US schools. Some schools offer it for both breakfast and lunch, others only at lunch. Some schools have banned flavored milk altogether, but studies sponsored by the dairy industry show that when this happens, milk consumption overall drops about 37%. Flavored milk’s foes say that such studies are biased. If only plain milk is offered, they say, children will happily drink it; thus far there have been no studies produced to back up that claim. Foes of sweetened milk also link its consumption with increased obesity, but again there have been no studies done to provide support for that view. Studies of the role “sweetened beverages” play in obesity have focused on soda, sweetened teas, juice drinks, and sports drinks, not flavored milk. Many parents, including many well informed parents who are not in the pay of the dairy industry, feel that their kids will only drink milk if the taste is masked by something sweet. They would rather their children get the nutritional benefits of milk, even if it means they also get some sugar. School food directors worry that with flavored milk off the menu, fewer students will eat school meals. The fixed expenses of labor and overhead eat up more than half of a school’s nutrition budget, so any drop in the revenue from meals served can result in cuts to the quality of the food for those who continue to eat school meals, typically the poorest students. Opponents say that sweetened milk has no place in our schools, and that offering it just teaches kids to want sugary beverages. Parents whose children drink plain milk at home, say they don’t want their kids tempted by flavored milk at school. Other opponents include those who support the view that sugar is toxic, and some high profile school food reformers like Ann Cooper, who calls chocolate milk “soda in drag” – and Jamie Oliver, who says it is just like candy. Both sides are right – and both are wrong. The anti chocolate milk forces are wrong to lead the public to believe that chocolate milk is identical to soda or candy. They base this claim on the grams of sugar found in each, without explaining that up to two thirds of the sugar in flavored milk is put there by nature, not by the Evil Dairy Industry. Plain white milk contains lactose, a form of sugar which occurs naturally in milk. An 8 oz. carton of plain skim milk has about 14 grams of naturally occurring sugar, while a chocolate milk carton can have as much as 28g sugar (14g naturally occurring, another 14g “added”), or as little as 20-22g (14 naturally occurring, 6-8g “added”), depending on how much sugar the dairy feels customers want. By contrast, all 26g sugar in 8 oz. of Coke is “added” sugar, as are all 24g sugar in a chocolate bar. Soda contains no nutrients apart from its calories, whereas milk contains large amounts of protein and calcium, as well as Vitamins A, B2, B3, B12, D, phosphorous and potassium. Can you name a single candy bar packing that much nutrition? Any product with that many nutrients would be marketed as a “nutrition bar,” not candy. However, flavored milk’s opponents are right to object to the amount of added sugar in current formulations of the product. Is it really necessary for a beverage which already enters the world with 14g sugar in 8 oz., to be tarted up with another 14g sugar just to get a kid to drink it? A recent press release from the International Dairy Foods Association boasts “the average calorie level of flavored milk sold during the 2009-2010 school year was reduced nearly eight percent compared to the 2006-2007 school year.” Eight percent? Over three years? Are you kidding me? News flash, Dairy Industry – it’s not enough! Meanwhile, the supporters of chocolate milk are right to fear that its removal may lead many children to skip milk at school altogether, because that is what the available evidence has shown to be true. Foes may claim that kids happily drink white milk if that is all that is available, but where are the studies to support that belief? However, chocolate milk’s fans are wrong to minimize the sugar issue. While added sugar is not the sole cause of obesity, the American diet contains far too much added sugar, and even parents who allow chocolate milk say they wish it were not so sweet. The one thing that everyone agrees on is that there is no agreement. Each side trots out their own medical professionals, dietitians or fervent parent supporters to explain why their view is the only rational one. Tempers flare, sound bites replace facts, and everyone digs in, determined not to yield an inch. When school food reformers play fast and loose with the facts, it tarnishes the credibility of everyone working towards better school food. There is a legitimate case to be made for reducing the added sugar in school milk without having to resort to misrepresentation. When advocates who share a common interest in fighting child obesity are at each other’s throats over whether chocolate milk is a tasty way for kids to get important nutrition, or the Drink of Satan, the whole school food reform movement suffers, and that hurts kids. But there is a middle ground. Dairies don’t need to add as much sugar as they do to flavored milk. School districts are big customers, and they can use their buying power to force the dairies they do business with to dial back the sugar. That’s just what happened in Fairfax (Va.) County Public Schools, the 11th largest district in the country. The district stopped offering flavored milk in June 2010, and by April 2011, it was reported that a new lower sugar version of chocolate milk would be reintroduced to the schools. The reformulated milk has 22g total sugar per 8oz serving, a reduction of over 20%. San Francisco public schools have also demanded, and gotten, a chocolate milk formulation with less sugar. In addition to demanding a much less sweet version of chocolate milk, schools can take other steps to radically reduce the amount of added sugar kids consume in their milk. For example, they could drop strawberry milk altogether, since it usually has even more added sugar than chocolate, plus artificial coloring. They could limit the serving of chocolate milk to one meal a day, not two. 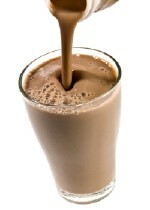 They could position the chocolate milk at the very end of the line, after the plain milk, as recommended by Brian Wansink, of the Center for Behavioral Economics and Childhood Nutrition at Cornell University, whose research has shown that this simple, no cost move increases the amount of plain milk kids choose. More nutrition education can help students learn to make their own responsible food choices, not just at school, but out in the world, where a school wide ban on flavored milk will not protect them. As we move closer to the 2012-13 school year implementation of the new Healthy Hunger Free Kids Act school meal requirements, which the USDA estimates will cost 64 cents per student per day to implement, but for which the government is providing only 6 cents, it is more important than ever that advocates for better school food be able to come together behind needed reforms. Taking an inflexible hard line on chocolate milk – pro or con – only serves to divide advocates who need to support each other. It is magical thinking to believe that Americans, who typically consume 156 pounds of added sugar per year, will simply stop, cold turkey. More reasonable is a plan to wean us off sugar by continually reducing the amount added to our food. Why not start by demanding that dairies reduce the added sugar in flavored milk to 4 grams per 8 oz (that’s 1 teaspoon, or the same amount of sugar many adults add to their morning coffee or tea), and nothing artificial, please. Much has been written about how too much sugar has crept into every aspect of the American diet, from soup to nuts. Let’s start using our power as consumers to dial it back – waaay back – not just in our schools, but in our entire food supply. Dana Woldow has been a school food reformer since 2002. She shares what she has learned about advocacy at www.PEACHSF.org.